The new multiauthor version of Red State Rebels is now online. Click here. It’s been almost four years since I started Red State Rebels. The blog has served as a focal point for Idaho’s blue blogging community for several years now, and it’s been a lot of fun to write. But the time has come to move on. As of tomorrow, I am taking a new full-time equivalent position with my longtime client, the Study Circles Resource Center (soon to be renamed Everyday Democracy). SCRC helps communities use inclusive dialogue and creative action to address all sorts of issues: racism, immigration, growth, poverty, police-community relations, and more. My work will include launching a new national blog, DemocracySpace, as well as helping community activists and public officials make greater use of online media. Because this work is nonpartisan, I have decided the time is right to retire Red State Rebels in its current incarnation. I plan to launch a new, multi-author version of RSR sometime soon – and then mostly back away. I will leave the RSR archives online as a historical record of the past four years. (You can hit the tip jar at left to help me do that, and to help underwrite the new site.) Once I get my bearings in my new gig, I may occasionally surface with posts at the new RSR, at Daily Kos, and elsewhere. I will continue to write the Boise Bus Blog, and I have another non-political "hobby" site I hope to launch soon, too. While it’s a little bittersweet for me to bid farewell to Red State Rebels, I know the progressive Idaho blogosphere is in great shape (and in great hands). I am proud of the role I’ve played in getting it this far, but I couldn’t have done it without your help – your comments, your tips, your links, and your loyal readership. I believe Democrats will make great gains in the 2008 elections, both in Idaho and nationally, because voters here and across the nation will ultimately choose hope, unity, and compassion over fear, division, and cruelty. Need a blog fix? Check out some of the other local and regional sites listed at right - and watch this space for news of Red State Rebels redux. I've also posted several dozen of my favorite posts below. Here’s to the future! Happy Labor Day! In our culture, many of us worship (or at least admire) athletes, actors, musicians, politicians, and wealthy entrepreneurs. Some of these high-profile people are worthy of the acclaim; others, not so much. Tim Woodward has a good story in today's Idaho Statesman interviewing several people who do the dirty jobs we often overlook. What's the dirtiest, hardest, or generally most objectionable job you've ever held? What's your favorite job you've ever had? P.S. Also in today's Statesman, a great op-ed by Dave Whaley of the Idaho AFL-CIO. Dave writes: "This Labor Day is an opportunity to demand that our economy once again meets our needs. We can do this by calling on all our elected officials to start supporting a working people's agenda. Let's create good jobs and provide employers with incentives to keep them here. Let's make sure workers can live in dignity with health care and retirement security. Together, working people can get back in the driver's seat and make sure our elected leaders and our economy works for us." More here. Imagine Larry LaRocco's surprise. One night last week, he goes to bed thinking he's probably on his way to another losing political campaign in his home state of Idaho, where being a Democrat can be a lonely pursuit. The next morning, he wakes up to the screaming banner headline in the state's largest newspaper saying that his opponent, a conservative stalwart who has been winning elections in Idaho for 30 years, had pleaded guilty to disorderly conduct for tawdry behavior in a men's restroom at a Minnesota airport. Yes, even for a Democrat in Idaho, some days it really is worth getting up in the morning. Less than an hour after Sen. Larry Craig (R-Idaho) announced his resignation on Saturday, Sen. Charles Schumer (D-N.Y.) said Democrats can win his seat next year. Schumer, head of the Democratic Senatorial Campaign Committee, called the bathroom incident that led to Craig's political demise "a tragedy" and said the senator "did the right thing by stepping down." In his released statement, Schumer added, "Democrats can win in Idaho, and we intend to run a competitive race." Larry LaRocco's ActBlue page has been bustling these last few days. Today, he ranked #2 - behind only John Edwards - for the day's busiest pages. If you haven't already, help LaRocco make a strong showing for this month's FEC report by kicking in a little something here. Today was as much about Idaho history as it was about politics. Here are a few photos I took at the Boise Depot this morning. Hundreds of people were on hand for Craig's announcement. Crystal White was one of several people holding signs referring to Craig's arrest in a Minnesota airport men's room, the disclosure of which led to his swift political demise. The sign says, "Craig is not gay. He's a pervert." 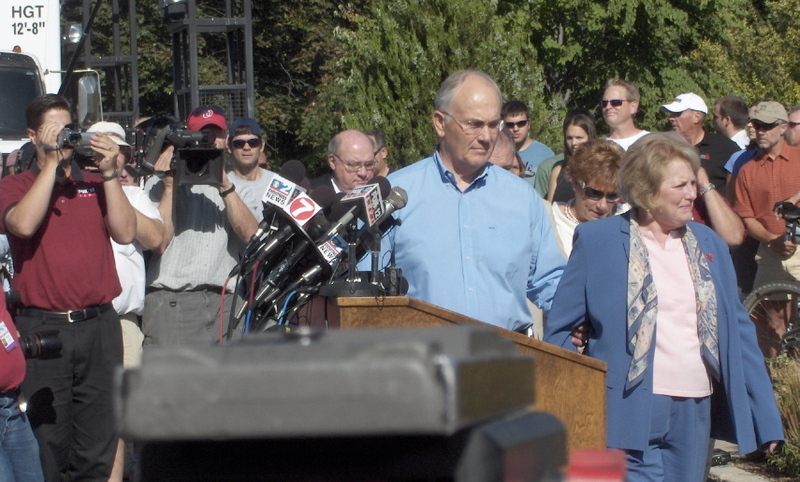 Larry and Suzanne Craig approach the podium. 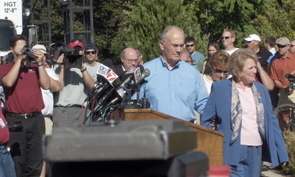 The Craig family was joined at the podium by Tom Luna (partially visible), Butch and Lori Otter, Idaho GOP Chairman Kirk Sullivan, and Rep. Bill Sali. The most surreal week in Idaho political history is expected to reach its conclusion this morning. 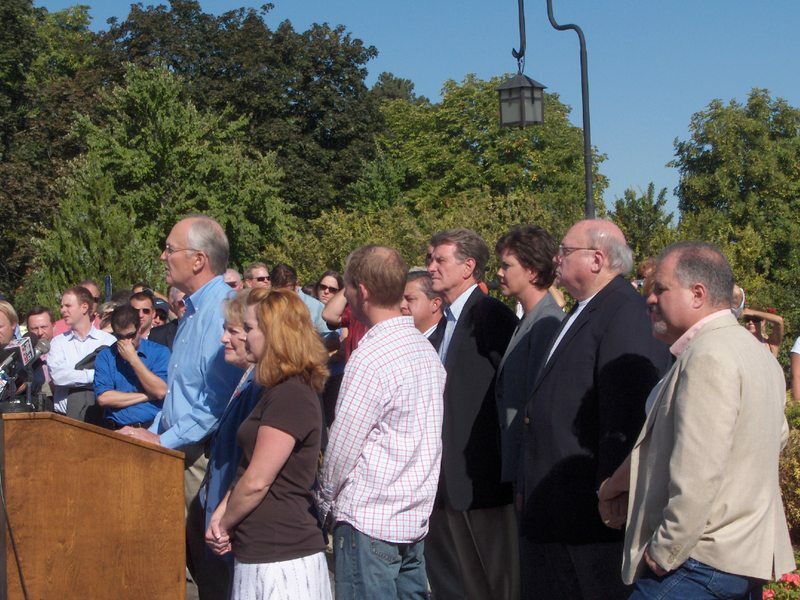 Embattled Sen. Larry Craig has scheduled a press conference at 10:30 at the Boise Depot. Use this as an open thread to discuss what Craig has to say, how he says it, and its implications for the future. PrideDEPOT, NewWest.net, MountainGoat Report, and the Idaho Statesman, and analysis at 43rd State Blues. Update 1:15 p.m.: Here's an exhaustive compilation of Larry Craig-related political cartoons. Many are funny, some are sad, all make it clear Craig's career was, um, in the toilet. Friday was my final day on the LaRocco for Senate campaign. In July, I accepted an offer to launch a new national blog for community organizers and public officials. I start that job Tuesday; I'll have more news on that next week. Meanwhile, yes, I've needed to keep quiet on the Larry Craig issue because of my role on the LaRocco campaign - and I feel it's only decent that I continue to do so right now. I do plan to attend Craig's resignation press conference this morning and will post a diary at Daily Kos. I've also put up an open thread as a place to discuss the news and its implications. But here's a personal update from me on the LaRocco campaign. Even before this week's events, I was (and am) convinced he has a shot. Idaho hasn't elected a Democrat to the U.S Senate since Frank Church. We are way overdue. No matter which Republican winds up running next fall, LaRocco will have the edge in several key areas: Iraq, veterans and military affairs, energy independence and the environment, and concern for Idaho's working families. Larry LaRocco was Frank Church's protege. He worked with him for six years, crafting landmark legislation to protect Idaho's wilderness. Later, as a member of the House of Representatives, LaRocco wrote the bill to create the Snake River Birds of Prey National Conservation Area - the last bill signed into law to protect wild Idaho. He has crafted a comprehensive energy plan to help curb greenhouse gas emissions, reduce our dependence on foreign oil, and create good Idaho jobs. LaRocco will also be a strong voice to end the war in Iraq and avoid future preemptive wars. As Larry says, "Do right, risk consequences." In January 1991, as a brand-new congressman from a conservative state, he voted for the Hamilton-Gephardt Amendment to pursue increased diplomacy and sanctions before we went to war in the Persian Gulf. As an Army veteran who has seen terror firsthand, he understands the threats we face today, but he will never commit troops to a war founded on false premises. LaRocco is also committed to the strong Democratic Party principle of standing for working people. All this summer, he has been taking jobs with people all over the state - hauling garbage, shadowing a nursing home employee, making cheese, packing parachutes for smokejumpers, learning about criminal justice, baling hay, sweeping up after union carpenters, and so on. These are great campaign photo opps, to be sure. But much more importantly, they give LaRocco a chance to spend eight hours with people who share their stories about what it's like to work in a state where low wages prevail; housing, medical, and food costs are up; and where families struggle daily with huge responsibilities. When he goes to the Senate, these people will go with him. As Larry says, "This election is not about my job. It's about your job." Although I'll soon be backing off partisan blogging to focus on small-d democracy (more on that next week), I plan to continue my efforts to elect Democrats in Idaho and build greater Dem majorities in Washington, D.C. I will be volunteering for and contributing to the LaRocco campaign, and I hope you will, too. Update: E Pluribus Media interviewed Larry at the YearlyKos convention in Chicago and just posted the podcast today. 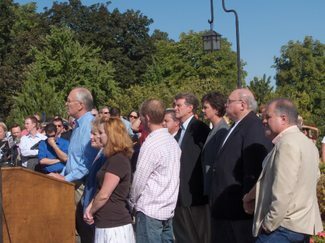 Several well-placed GOP sources in Washington and Idaho have told CNN that embattled Republican Sen. Larry Craig is likely to resign soon, possibly as early as Friday. GOP source with knowledge of the situation told CNN's Dana Bash that the Republican National Committee was poised to take the extraordinary step of calling on Craig to resign. However, that move was put on hold, the source said, because top party leaders have received indications that Craig himself is preparing to step down. Sources have confirmed that high-level meetings on the matter were being conducted in Idaho on Thursday. Craig has been under pressure to quit since news surfaced this week that he was arrested in June at Minneapolis-St. Paul International Airport and later pleaded guilty to a disorderly conduct charge. The arrest was made by an officer investigating reports of sexual behavior in an airport restroom. Update 3:48 p.m.: The Idaho Statesman and the Politico both report that Craig's next statement is forthcoming Saturday morning. Update 5:30 p.m.: The AP says Craig will resign Saturday. Craig's staff would neither confirm nor deny the report.